Simple GPS Odometer based on an ATtiny2313. We've travelled 2.5 miles. One way to measure the distance travelled is to regularly calculate the distance from your last location (latitude and longitude) to your current location, and then keep a running total of these distances. This is the method used by some other odometer projects, but it requires tricky floating-point or fixed-point calculations. There's actually a much simpler way. The GPS module regularly provides the instantaneous speed (in knots). To get the distance travelled we simply integrate this, or keep a running total of the speed multiplied by the time between readings. The arithmetic is now a simple multiplication and addition. Although I could have implemented this odometer using the same circuit as my earlier Tiny GPS Speedometer [Updated], I decided to base this on Sparkfun's tiny four-digit bubble display , available from Proto-PIC in the UK . To drive it directly from the processor I needed at least 15 I/O lines; eight for the segments plus decimal point, four for the digits, plus two for the crystal and one for the GPS input. 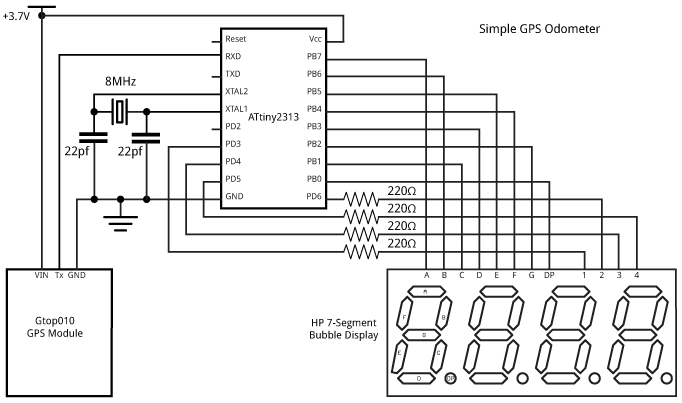 The ideal choice seemed to be the ATtiny2313, which has the added bonus of including a USART to receive the NMEA messages from the GPS module. For this application I used a cheap GPS module, the Gtop010 (also known as GTPA010 or PA6C) available from PV Electronics for under £20 in the UK . Alternatively, the similar Gtop013 (or PA6H) is available from Adafruit , or you could use their breadboard-friendly Ultimate GPS Breakout . 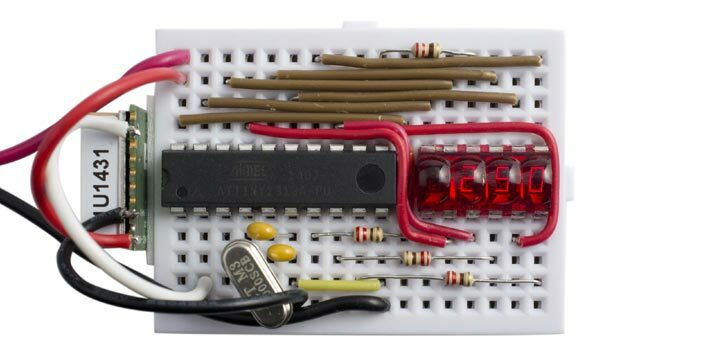 The wiring between the ATtiny2313 I/O ports and 7-segment display may look a bit arbitrary, but it was chosen to make the connections simpler on the breadboard; the actual assignments are taken care of by the software as explained below. The only restriction is that each segment should be connected to a pin on Port B. You could omit the need for this routine, and save program space, by wiring the segments to specific I/O pins: G to PB0, F to PB1, etc, and DP to PB7. We could use millis() to read the speed once a second, but because the GPS module outputs readings at precise one-second intervals we can simply wait for each updated reading. To display the distance in miles with two decimal places, the speed in knots is multiplied by 1.150779 and divided by 3600; 19/59438 gives a good rational approximation to this. Note that the GPS module can give small speed values even when you are stationary; to avoid these accumulating to give an apparent distance reading the program ignores speed values less than 100 (1 knot). The final program uses 1902 of the available 2048 bytes. See the end of the article for a link to the whole program. This adds an ATtiny2313 @ 8MHz (external crystal; BOD disabled) option to the Board submenu. Select this, and choose Burn Bootloader to program the ATtiny2313 fuses for an 8MHz external crystal. Then upload the program to the ATtiny2313. 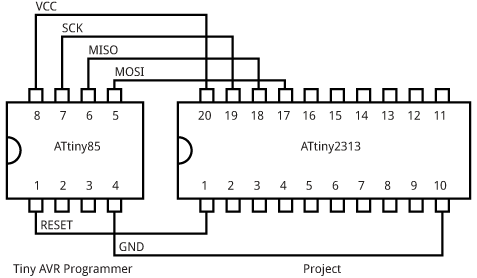 Note: The GPS module is rated at a maximum supply voltage of 4.3V, so you should disconnect it from the circuit while programming the ATtiny2313 using the Tiny AVR Programmer, which supplies 5V to the circuit. The circuit was powered by a 3.7V LIPO battery, and the total current consumption was about 30-40mA. I tested the project by taking it for a drive in the car, and verified that the reading closely matched the car's odometer. Here's the whole Simple GPS Odometer program: Simple GPS Odometer Program. It would be a simple extension to add buttons to the two spare I/O lines to allow you to change the display to show speed or current time in addition to distance. Add a button between Reset and GND to allow you to reset the odometer to zero. 6th April 2015: Added a note about disconnecting the GPS module when powering from a computer. ^ Bubble Display on Sparkfun. ^ Bubble Display on Proto-PIC. ^ Micro GPS Module on PV Electronics. ^ Ultimate GPS Module on Adafruit. 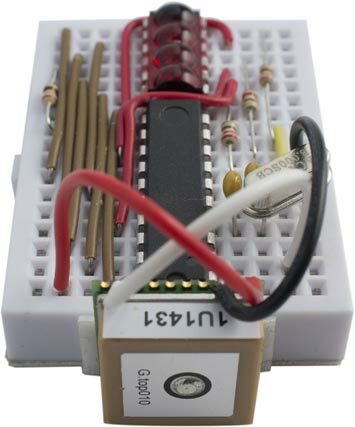 ^ ATtiny core for Arduino: arduino-tiny on Google Code.